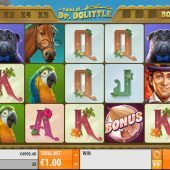 Tales of Dr Dolittle slot may have a childish title but the graphics aren't too silly as Quickspin takes us back to the tales of our childhoods, much like Netent have with their Fairytale Legends series which include Red Riding hood and Hansel and Gretel. Mind you, having said that a child could understand this very simple games as we'll see with the reels set over a storybook background and Disney cartoon-style music playing as we spin. 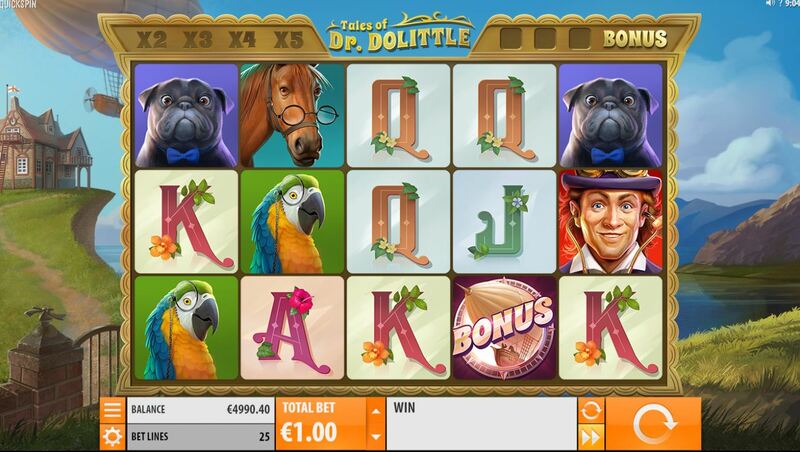 Just let's hope Dolittle can do a lot for our bankroll here! We begin with a standard 5x3 grid but unusually this is made of 15 individual reels as with slots like Jack Hammer and Barber Shop Uncut. This means symbols can appear up to three times on each column so we can get 5-of-a-kind wins over several of our 25-lines simultaneously. For that reason the 5-of-a-kind pays aren't great and the best is Dolittle himself at 2x stake, Parrot 1.6, Horse or Dog 1.2 with five card values at 096, 0.8 and 0.6x for a full line. Wilds appear too and these actually multiply wins where they count at 2x multiplier for 1, 3x for 2, 4x for 3 and 5x for 4 in the win. Any wins in view will hold their winning tiles and respin the rest until no further improvements are created. This includes the Wilds too and if you've played the Jack Hammer 1 or 2 slots you'll be familiar with this mechanic. Bonus scatters don't hold during respins here so we need 3 or more to land simultaneously. When they do you will be rewarded with 10 free games that cannot retrigger. There are no pays for the scatters either, but during the free games you are guaranteed at least one Wild to appear each spin on the grid, although whether this will count in a winning line is down to chance.